Newly opened LUX* North Male Atoll has a special Easter surprise! 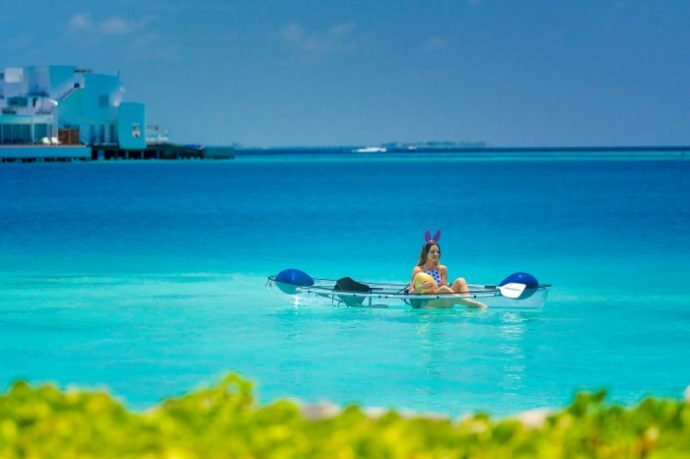 The island is organising an underwater golden egg hunt in its crystal clear lagoon with an ultimate prize of a complimentary night’s stay at the resort. The whole island will be transformed into a magical Easter wonderland with insta-worthy human-sized Easter eggs all around the island as well as ‘one of a kind’ magical experiences for everyone. A short transfer from Male by speedboat, this intimate resort is a visual feast of nautical forms and tones. A next-level resort that sweeps away the thatched-roofed Maldivian footprint of old with a dazzling paradise of penthouse villas and spectacularly designed spaces to play, relax and retreat. Harnessing the fresh vision of Singapore design house Miaja, each of the 67 double storey residences and rooftop features a private pool blending superyacht panache with a vibrant South Beach pulse with four elegant eateries and two bars. For the first time in the Maldives, each residence is crowned with a magnificent private rooftop relaxing area. There’s a wealth of ways to relax or raise your game, and the invitations to adventure are endless. Guests will find two swimming pools, a translucent overwater LUX* ME Spa, world-renowned diving, high adrenaline water sports, private yacht voyages, tennis and beach volleyball courts. A uniquely exclusive paradise retreat — where breezy island living meets jet-set chic — LUX* North Male Atoll is luxury beyond boundaries.